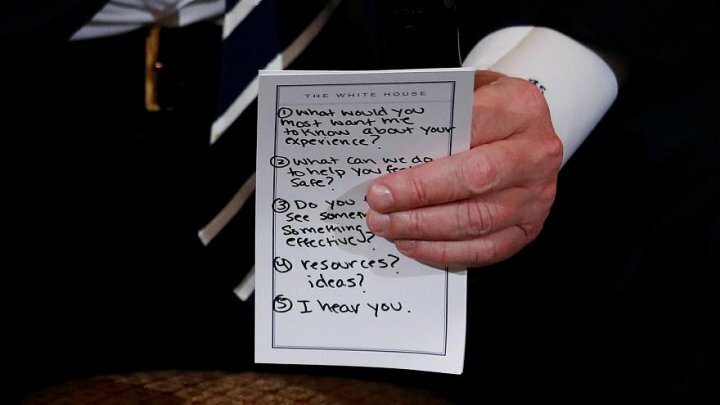 The marked paper included phrases: “What can we do to make you feel safe?” and “I hear you”, prompting widespread criticism online. It was not immediately known who wrote the instructions on the cue card. Former student Nikolas Cruz, 19, shot and killed 17 fellow students and teachers at Marjory Stoneman Douglas High School on February 14, while 14 were taken to hospital. Survivors of the attack, including representatives of advocacy groups formed after the school shootings at Columbine High School and Sandy Hook, attended the listening session with Trump amid efforts to pressure the administration to tighten gun control laws in the United States. Vice President Mike Pence and Education Secretary Betsy DeVos were also present. Days after the school shooting, thousands gathered in Fort Lauderdale, Florida, to protest for stricter gun control legislation. A National School Walkout is also being planned for next month, while another demonstration dubbed “March For Our Lives”, which calls for an end to gun violence and safer schools, has been set for March 24 in Washington DC.